The Indy Pro Showcase was created by Nick Belmonte and Dave Marcon to help the players that were not drafted or were not seen by professional scouts to fulfill their dream of playing professional baseball. To find the proverbial “diamond in the rough”. To date, Nick and Dave have helped (signed) over 1400 players fulfill their dreams. The goal is to find that player that was overlooked and get him playing immediately. In the last five years alone(2012-2016), 14 players discovered through the Indy Pro Showcase have been made Baseball America’s Top Ten Indy Prospect list! Nick Belmonte has been signing players to pro contracts since 1990. In that time he’s signed over 1400 players, with that count rising every year. 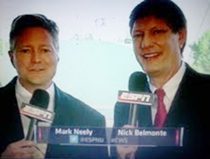 For that reason the Chicago Cubs hired Nick in fall 2015 as a scout and consultant for the area of independent baseball. As a collegian Nick set the SEC stolen base record at the University of Florida and still holds the school’s single season mark. 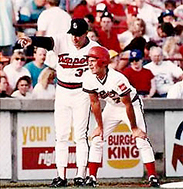 As a professional player in the Brewer and Expos organizations one of Nick’s achievements was stealing 52 bases in 70 games for Boise in the Northwest League. 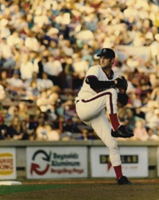 As a manager for 3 years of the Salt Lake Trappers, Nick had the best winning percentage of any manager in professional baseball during that time including pro baseball’s only .700 winning percentage in 1991 which ended in the league championship. In 1993 Miles Wolf, the father of Indy Baseball, sought Nick out to put together the players for the first all independent league, the Northern League. In the first year alone Nick was instrumental in the signings of shortstop Rey Ordonez, 3b Kevin Millar, and lhp Eddie Orapesa. All 3 making it to the Major Leagues. After eight years as the player personnel director of the Northern League, Nick started Independent League Consulting where he works for various independent leagues and teams as the player personnel director, including Northern League Champs Duluth(1997), Adirondack(2000), ’08 Can am Champs Sussex , ’09 American Association Champs Lincoln, and most recent the 2016 Ottawa of the CanAm League. 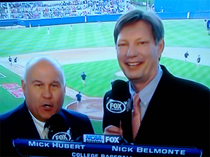 Many people know Nick from his broadcasting career as the longtime television color analyst for college baseball working for Fox Sports, SEC Network and ESPN. In 2007 Nick and his former Salt Lake City championship game pitcher Dave Marcon started Indy Pro Showcase where in just 21 showcases to date have gotten over 700 players jobs in over 6 different leagues and MLB teams. Indy Pro Showcase participants count for 25% of Baseball America’s Top Ten Indy Pro Prospects list the past five years.